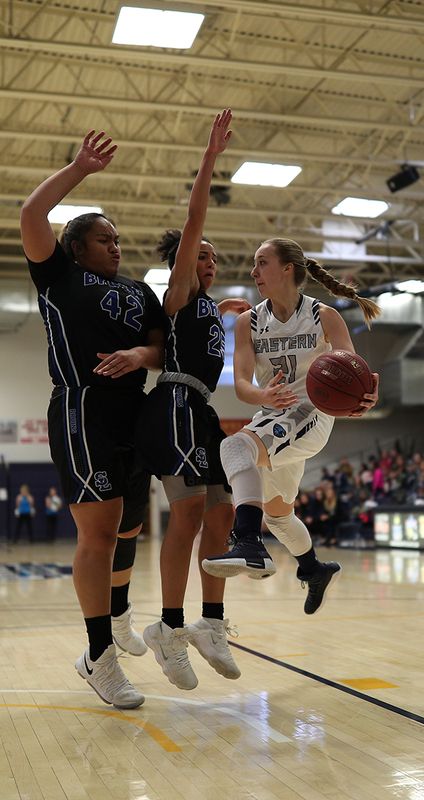 January 18th saw a round of nail-biting action, as the Utah State University Eastern Women’s Basketball team traveled to Snow college to take on the Badgers. The game began with Snow jumping into the lead by the score of 12-2. The Eagles pushed back, but Snow continued to climb the point ladder and left the first quarter leading 20-7. Errors made at the beginning of the match allowed the Badgers to take a large lead. The Eagles coach, Chelsey Warburton, explained how mistakes were made on the defensive end. “We had defensive scout breakdowns which gave Snow open looks that they scored. We also forced shots on the offensive end,” Warburton said. The Eagles finally buckled down and began to make a comeback in the second quarter. They pushed and continued to close the gap throughout the rest of the game. The audience were on the edge of their seats by the final quarter, as USUE managed to cut the lead to 60-58. With 4.5 seconds left on the clock, Snow managed to drain two free-throw points. On the Eagle’s next possession, Madison Loftus made a miraculous three-point shot from half court before the buzzer sounded, but it still was not enough to tie the game. Loftus led the team in points, putting up 19 total. Alyssa Crumley finished behind her with 17 points and Sidney Springer led the team in rebounds, snagging 10. The final score was 62-61, a very close game for the Eagles. On Saturday, January 21, USUE traveled to the College of Southern Idaho to take on the Golden Eagles in another close game. The Eagles battled gravely, but suffered injuries to two key players. Coach Warburton said she was proud of her bench for coming in and doing a wonderful job. Loftus led the game with 20 points and Autumn Kay, coming off the bench, managed to put up 17 points for the Eagles as well. “Autumn’s minutes were key,” Warburton said. “She gave us a spark off the bench and played tough defense.” Springer and Raschel Blazzard led the team in rebounds, each grabbing seven. The ladies battled the whole game, but fell short with the final score 72-76. Coming off losses in the last two games, the Eagles were ready to take on Colorado Northwestern Community College. They started out strong, and continued to increase their lead every quarter. The Eagles dominance held up, and they won 83-51. Crumley led with 17 points, and a few other players came off the bench to help seal the win. Springer and Kay were both key players in the game as they filled in for an injured Kaitlin Tolouno. Harlee Willoughby also had a great game, coming off the bench to grab seven points, seven assists, five rebounds, and three steals. To finish out the week, the Eagles had a loss at home facing off against SLCC. The game began with Salt Lake jumping ahead by six points in the first quarter. And as it progressed, the Eagles found themselves falling farther and farther behind. The Bruins won the game, ending with a score of 66-51. Crumley led with 14 points, and Loftus led with six rebounds. In their next game, the Eagles will play College of Southern Idaho again at home.